i found some super cute patterns. the first one, which is basically a rip off of the robeez boot, i bought from here. the second, a more simple construction but still really sweet, i found on etsy. i started with the first pattern, just jumped right in using a cream leather and some fuzzy bamboo/cotton towelling for the inside. it actually looks great in this photo but, let me tell you, i had some issues with the instructions and construction of this one. forget the fact that it's really narrow, that might be my own fault for using such a thick lining, although the pattern does suggest such things as fur and sherpa, which would be equally thick. forget the fact the instructions of how to insert the elastic at the end make pretty much no sense and doesn't seem to do anything to help with keeping the boot on little feet. the main problem, for me, was that at one point, you have to sew through EIGHT layers of fabric, with four of those being leather. i used a leather needle but i still had to gingerly hand crank my machine through these bits with terror in my heart. and the bloody thing doesn't even fit. 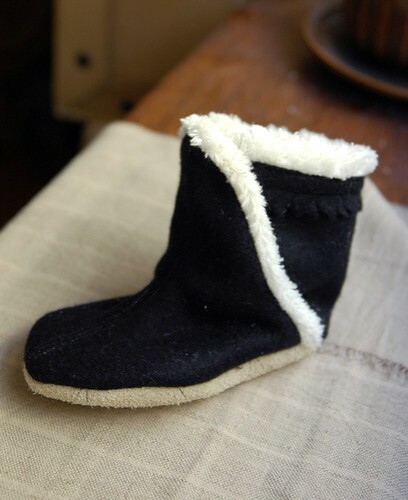 this time i used a sturdy wool felt with a leather sole and the same lining. these came together better because i had the experience behind me. i decided to ignore the instructions at the end and attach an elastic the way i thought it would work best. and it does. these ones actually just fit so i may have to make the second one and get these on mae's feet before they grow. they're still pretty narrow and i wasn't satisfied so i thought i'd better try the other pattern as well. finally! limited success!! i ignored the binding and just made the boot and lining how i thought they should be. 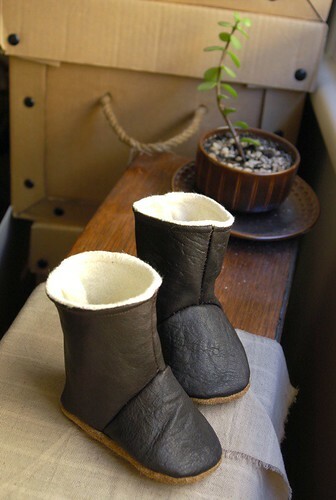 and i used leather this time, with a suede sole to prevent slipping and the organic cotton fleece inside. i'm pretty happy with these, they're sort of camper-esque, no? i would have been VERY happy with them but i meant to add some elastic into the lining to make them stay on better and totally forgot. so there might be another pair on the way - after all this work i feel i need to achieve perfection, damnit!! Oh Leslie, you're amazing! That last photo looks straight out of a baby zakka book - perfection! I love also that you've documented all your booty-licious (sorry) efforts -I think the part of crafting I like best is the final 'eureka' moment when it works out! Wow, good on you for persevering! I think I would have given up mid-way through the first endeavour :-) Love the chocolate browniness of the last pair. awesome!... and your perseverance is amazing too : ) So pleased that they worked out in the end, I bet Mae is going to have such gorgeous toasty feet. Wow you are so clever, they are very cute! Oooh! Let me know when they go on sale! Why are little tiny shoes just the cutest things ever? All of your attempts, however successful in actual practice, look great to me. 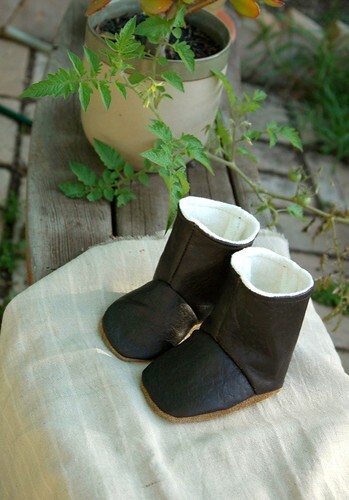 I even want a pair of these Camper-y booties just to display on a shelf because they are that adorable. Very nice! Wow! 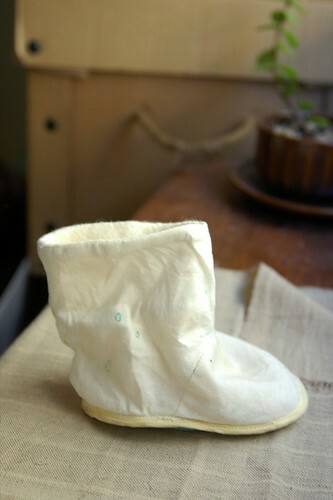 I would never even attempt to make little booties, but then again you are quite the talented lady. Every single little booty was adorable (functional or not!). i love the first one. and the last ones. and love that you are full of patience. amazing. adorable!!!!!!!!!!!!! love them all! 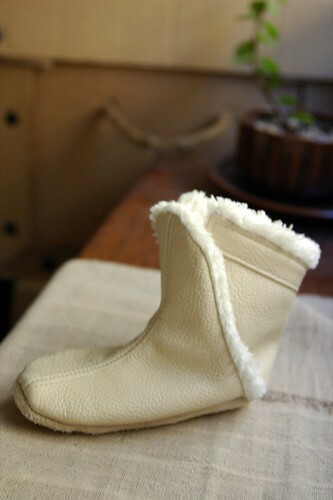 good job....I never thought of making boots for my little ones! leslie, what adorable boots. Geez, I probably would have given up on the 2 try, probably cursing and yelling! They look pretty damn good to me! Maybe the rejects can go to Kitty? So now wouldn't be the time to admit that I have so much trouble with sticking to stuff, that it's been a year since casting off one really, really lovely knitted sock and casting on its pair? I'm in awe. Great job. Sewing through all those layers must have been scary. Sometimes you just have to keep going - don't want to get beaten by the project. I think you won - that last pair are fantastic! You never cease to amaze me! I would have been so damn lazy and all 'i'm a mother of a 10 week old' and bought the ones in the shop! Well done. Maesy is going to be stunning this winter! The last pair are great - even if they don't stay on well, they look very cool. I had a great pair for Amy that were leather, elastic sided, velcro opening up the back - so easy to get on and off and stayed on so well when done up. Amy wore them so much she wore a hole right through the toes on both of them! I cut them up in order to copy them for Wil but never got around to it. You are one seriously determined gal! I love the look of them all and truly admire your persistence. I must remember to send you an etsy shop I found in the week, indoor shoes for adults - a Vancouver producer, very cool shoes. you are like the little cobbler elves who make shoes while the rest of us sleep! http://www.etsy.com/shop.php?user_id=6198236 Here's the link to the shop I mentioned. I just made one of that last pattern and I too was miffed at the binding instructions but I think I got it. They DEFINITELY need elastic though which I forgot to add in my eagerness to get one sewn up to see what it looks like. I am yet to make it's pair andblog them, but am thinking of adding a little velcro strapo at the back since I'd have to go in and unpick to add the elastic to the first boot now. Love your leather versions. We must think alike as I had also planned to rip off the robeez boots my son used to wear until I came across that pattern on etsy. I was trying to think of nice soft fluffy inside fabrics and you know I have some of that bamboo towelling just sitting in a box somewher, so thanks for your post now I think I'll give that a go!